It was last year when the Choco Balls hit the market and every one is drooling with it's unique recipe. I have my own version of it too. Aside from that, we also manage to sell a lot of Choco Balls tub delivering to market, schools and friends. Every one is asking and raving on how to make it. Actually there are different versions of making it. You can watch over Youtube or simply put, google it. But today, I will share my simple recipe of doing it so that you can make your own dessert in just a matter of minutes. 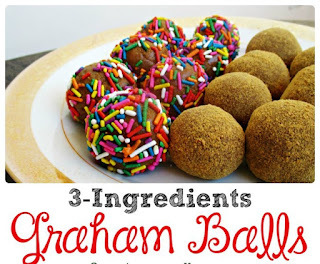 You can use carton boxes or disposable ones to store the graham balls before refrigerating it. You can also give them to your loved ones as a gift or make it your own business. Put 2 packs of MY San Crushed Graham in a mixing bowl and gradually put the condensed milk for the mixture. Mix together until you achieve the desired thickness. It should be not too smooth nor rough. 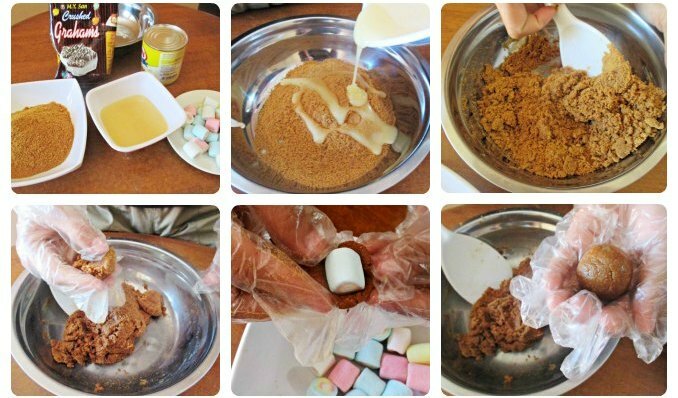 Get a tablespoon of mixture and press it to become flat. Roll the mixture on your palm to form a ball and fully cover the filling. Put the other pack of MY San Crushed Graham in a separate bowl. Roll over the mixture ball to cover it. You can add toppings (marshmallow minis or choco bits) for design or roll it over sprinkles instead on MY San Crushed Graham. I've done something like this before but using Ace biscuits. Hehehe. I didn't know how to add the marshmallows pa. I'm gonna try this at home! Yey! You just have to put it in inside before rolling it up :) You can also use choco bits or nips if you want. I made this before and it was a hit to the kids!